If voters pass Initiative 97, almost all land in Colorado will become off-limits to future oil and gas production. Colorado’s thriving oil and gas industry could face its biggest test to date after the Colorado Secretary of State on Wednesday certified Initiative 97 to appear on the statewide ballot in the coming November election. The measure aims to severely curtail where future oil and gas operations can exist in Colorado. If passed by voters, 85 percent of non-federal land in Colorado would become off-limits to future oil and gas exploration, drilling and production. Initiative 97 would create 2,500-foot buffer zones around “occupied structures” and “vulnerable areas” where future oil and gas production would be off-limits. "We felt it was important to be able to designate areas like playgrounds as also vulnerable areas. And protecting water is an incredibly important thing to Coloradans," said Anne Lee Foster with Colorado Rising, which is behind the initiative. "I don't think anyone should be subjected to industrial development 2,500 feet from their home." Current state regulations, approved in 2013, set buffer zones that prohibit oil and gas production within 500 feet of homes and occupied buildings. 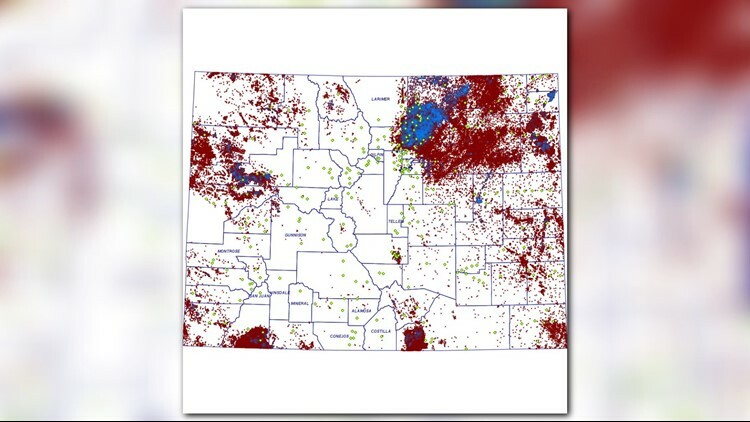 Oil and gas fields of Colorado. Historical and current production. A 500-foot setback translates to a circle of about 18 acres around any given point, while a 2,500-setback would prohibit oil and gas development in a circle of about 450 surrounding acres around any given point, according to an assessment by the Colorado Legislative Council. "Coloradans need to know exactly what is at stake: private property rights, more than 100,000 goodpaying jobs, more than $1 billion in taxes for schools, parks and libraries, and our nation’s energy security. A half-mile setback is a blatant attempt by activists to ban oil and natural gas in Colorado and put working families on the unemployment line." Initiative 97 applies only to state and privately held land. The measure grandfathers existing wells and does not impact future production on federal lands. But language in the measure states that dormant oil and gas infrastructure will qualify as future production if the infrastructure comes back online. 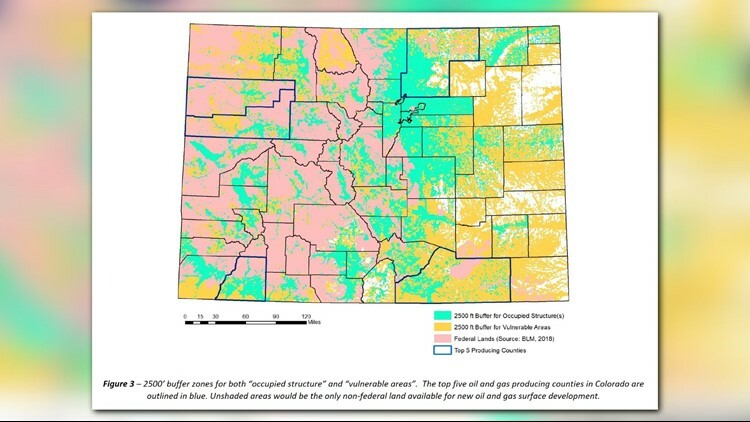 The Legislative Council’s impact statement says the impact on future oil and gas production will vary regionally across Colorado, depending on the amount of privately held land, population density and proximity to vulnerable areas. The Council says the Julesburg basin in northern Colorado will be the most affected. The Colorado Oil and Gas Conservation Commission released its own assessment of Initiative 97. The COGCC impact statement examined how a 2,500-foot setback would impact Colorado’s top five oil and gas producing counties. The Julesburg basin lies underneath much of Weld County, the state’s largest oil and gas producer. Under Initiative 97, 78.1 percent of Weld County’s total land surface – private, public, state and federal land – would become off-limits to future oil and gas production. When federal land is excluded – they fall under a different set of regulations – the COGCC assessment says Initiative 97 would prohibit future oil and gas production on 85 percent of Weld County’s non-federal land surface. In the state’s next four largest oil and gas producing counties – Garfield, La Plata, Rio Blanco and Las Animas, which all contain large tracts of federal lands – Initiative 97’s 2,500-foot setback would eliminate future oil and gas production on between 98.6 percent and 99.9 percent of non-federal lands. According to the Secretary of State's office, the backers of Initiative 97 turned in 172,834 signatures. They were given credit for 123,000 ballot signatures but only needed 98,492 valid signatures to qualify to appear on the November ballot. “Coloradans need to know exactly what is at stake: private property rights, more than 100,000 goodpaying jobs, more than $1 billion in taxes for schools, parks and libraries, and our nation’s energy security. A half-mile setback is a blatant attempt by activists to ban oil and natural gas in Colorado and put working families on the unemployment line."